The future for Guyana’s girls is bright, High Commissioner of Canada to Guyana, Lilian Chatterjee said as she joined in the celebration of the International Day of the Girl Child. Today, as Guyana and the rest of the world observes International Day of the Girl Child, High Commissioner Chatterjee hosted all the candidates and winners of this years’ President, Prime Minister and High Commissioner for a Day pitch, at her residence. President for the Day, Renuka Persaud, interacting with a staff from the Canadian High Commission. Winners and candidates who participated to be the President, Prime Minister and Canadian High Commissioner for the day were treated to tea at the Canadian High Commissioner’s residence in observance of International Day of the Girl Child. High Commissioner Chatterjee is joined by High Commissioner of the Day, Sara Mohan [right] as she greets the girls. Canadian High Commissioner to Guyana, Lilian Chatterjee, interacting with the young girls. The Canadian High Commission had invited video submissions from young Guyanese girls to serve in the roles, in observation of International Day of the Girl Child. The High Commission received some 20 submissions of which Renuka Persaud was selected to act as President, Delecia George as Prime Minister and Sara Mohan as Canadian High Commissioner. 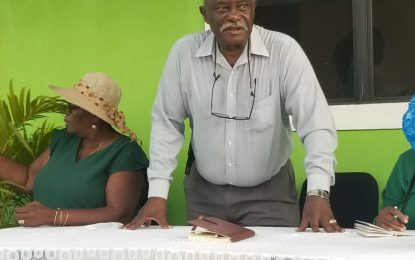 “I have to say, I am so proud of the young women in Guyana because they are articulate, they are passionate, they are very smart, knowledgeable and full of confidence,” the High Commissioner reflected. October 11 has been observed International Day of the Girl Child since 2012. The day was set by the United Nations. High Commissioner Chatterjee noted that Canada moved for the adoption of the day which seeks to highlight and address the needs and challenges girls face while promoting girls’ empowerment and the fulfilment of their human rights. International Day of the Girl Child 2018 is being observed under the theme “With Her: A Skilled Girl Force”.